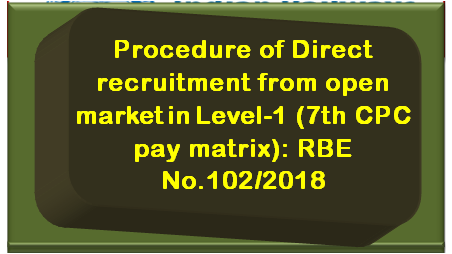 Sub: Direct recruitment from open market in Level-1 (7th CPC pay matrix) — Procedure-regarding. i) Para 1 (ii) of instructions contained under RBE No. 138/2014 dated 10.12.2014 lays down that “the number of candidates called for Physical Efficiency Test (PET) should be 02 (two) times the number vacancies”. ⇒ In modification of above, the number of candidates to be called for PET should now be 03 (three) times the number notified vacancies. ii) Para 3 of instructions contained in RBE No. 73/2008 dated 17.06.2008 lays down that “the number of candidates called for Document Verification (DV) shall be 20% over & above the number of vacancies”. In modification of above, henceforth, the number of candidates to be called for DV shall be twice the number of notified vacancies. iii) Para 2 of instructions contained in RBE No. 06/2014 dated 10.01.2014 stipulates that “no replacement panels are to be given against non-joining of selected candidates”. In modification of the above, it has been decided that the panel will now be formed to the extent of the notified vacancies with a standby panel of 50% of the notified vacancies. In case the main panel plus stand-by is also exhausted and still there is a shortfall vis-a-vis notified vacancies, the recruiting agency may further go down in the list of candidates which meet the requirement of minimum qualifying marks in their respective community for conducting PET (if needed) and DV/ME to the extent of shortfall community-wise. This may be done till the demand from the concerned Railway administration w.r.t. indent placed and vacancies notified is fully met. These provisions shall be subject to currency of the panel. 2. The above guidelines will also be applicable to recruitment notification published under Centralized Employment Notice No. 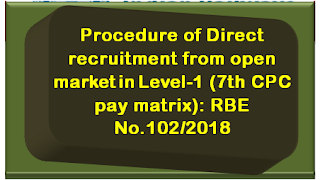 02/2018, issued by Railway Recruitment Boards.